Can Nitrogen Removal And Enhanced Biological Phosphorus Removal Coexist? Enhanced biological phosphorus removal (EBPR) is considered the most economical and sustainable way to remove phosphorus from municipal wastewaters, but its integration with nitrogen removal puts EBPR at risk for failure. Recent research helps resolve the conflict. EBPR is performed by polyphosphate-accumulating organisms (PAO) in a two-step process. During the first anaerobic stage (lack of oxygen, nitrate, and nitrite) PAO are able to accumulate volatile fatty acids (VFA) as internal reserve polymers (poly-hydroxyalkanoates [PHA]). The energy required is obtained through the hydrolysis of intracellular polyphosphate reserves, thereby releasing phosphate to the medium. Anaerobic organic matter uptake by PAO is a competitive advantage over other microorganisms unable to perform this uptake in the absence of an electron acceptor (oxygen, nitrate, or nitrite). Subsequently, under aerobic (oxygen) or anoxic conditions (presence of nitrate and/or nitrite), PAO degrade the accumulated PHA, obtaining enough energy for growth and cell maintenance. Part of the energy obtained is used to uptake and accumulate phosphate in the form of polyphosphate chains, which are used as energy source (i.e., which may be used under posterior anaerobic conditions). The net result of this process is the uptake of phosphorus (P) from wastewater, since the P taken up under aerobic and/or anoxic conditions is higher than the previously released under anaerobic conditions. P-removal is achieved due to the purge of these microorganisms after the aerobic phase, when the intracellular P levels are maximal. When the electron acceptor is nitrate or nitrite instead of oxygen, a fraction of PAO called denitrifying PAO (DPAO) is able to uptake P linked to denitrification. PAO are now classified into two types according to their different denitrifying capabilities (Flowers et al., 2009). One type (named IA or nitrate-DPAO) is able to couple nitrate and nitrite reduction with P uptake, while the other (named IIA or nitrite-DPAO) can only use nitrite instead of oxygen. Most of the research conducted on DPAO metabolism was initially focused on using nitrate as an electron acceptor, while the use of nitrite as a potential electron acceptor has been a recurrent research topic in recent years. The implementation of simultaneous biological removal of organic matter (chemical oxygen demand [COD]), nitrogen, and phosphorus in wastewater treatment plants (WWTPs) allows a sustainable and economic removal of nutrients from wastewater. However, over the years, it has been observed that the combination of these processes as in the conventional anaerobic/anoxic/aerobic (A2/O) configuration (Figure 1) results, sometimes, in the failure of EBPR due to interactions occurring between the metabolism of PAO and nitrate recycle from the settler to the anaerobic reactor through the external recycle. Figure 1. Scheme of WWTP configurations under study (top: anaerobic/anoxic/aerobic (A2/O) configuration; bottom: MLE anoxic/aerobic configuration). Red arrows show the main nitrate inlets to the anaerobic phase. The presence of nitrate in the reactor that should theoretically be anaerobic is one of the most widely reported causes of EBPR failure in WWTPs (Henze et al., 2008) and, despite its importance, the real reasons for this failure were not fully understood yet. The prevailing hypothesis assumed that, in the presence of nitrate or other intermediate species of denitrification, organic matter was preferentially consumed by ordinary denitrifying organisms, which reduce nitrate/nitrite to N2 gas. Thus, PAO lose the competition for the carbon source, resulting in EBPR deterioration (Cho and Molof, 2004). Other authors (van Niel et al, 1998; Saito et al, 2004) have hypothesized that nitrate, nitrite, or other denitrification intermediates can cause inhibition of PAO, which ends up with a loss of EBPR activity. In a recent research project, we studied the loss of activity of EBPR observed in municipal WWTPs due to nitrate recycle with the objective of understanding this failure and providing solutions to minimize its detrimental effect. A pilot plant (Figure 1) was initially operated with A2/O configuration to obtain simultaneous removal of COD/N/P. After four months working under stable conditions, a steady state with high nutrient removal capacity was achieved with a 70 percent of PAO (quantified by FISH [fluorescence in situ hybridization] microbial identification). The plant was moved to a Modified Ludzack-Ettinger (MLE) anoxic/aerobic configuration to study the effect of the presence of nitrate in the anaerobic phase by placing both internal and external recycles to the anaerobic reactor, thus maximizing the nitrate load to the theoretically anaerobic reactor (Figure 1). The pilot plant was first fed with wastewater containing a high percentage of VFA (75 percent of 400 mg COD/L). The internal recycle was progressively increased up to an internal recycle ratio of 10, resulting in a high nitrate load to the anaerobic reactor and nitrate concentration in the anaerobic reactor higher than 7 mg NO3--N/L. Even under these unfavorable operational conditions, the system was able to maintain a high P-removal efficiency above 85 percent. These results showed that carbon source was preferentially consumed in the EBPR process rather than ordinary heterotrophic denitrification, which is in disagreement with literature to date (Henze et al., 2008). In a next step of this study, the inlet carbon source was reduced to 200 mgCOD/L, testing two types of substrate: VFA and sucrose. For the wastewater with high VFA content, the reduction in COD did not affect the P-removal process despite the nitrate concentration in the effluent increasing. Conversely, when the main substrate was a more complex carbon source (sucrose), most of COD was used for heterotrophic denitrification, which resulted in a drastic decrease of P-removal capacity. Thus, the major role of the nature of carbon source in EBPR deterioration by the nitrate presence in the anaerobic reactor was demonstrated (Guerrero et al., 2011). The results can be explained considering the processes usually assigned to denitrifying microorganisms. Under anaerobic conditions, denitrifiers ferment complex carbon sources to produce VFA which are used by the PAO. The presence of nitrate prevents fermentation of complex carbon sources to VFA since this carbon source is directly denitrified, which is energetically more favorable. The experimental results show that nitrate input to the anaerobic reactor is not per se the direct cause of the loss of EBPR activity in urban WWTPs, but it is a key element that reduces VFA production — certainly having a negative effect. Therefore, WWTPs would be able to maintain biological P-removal despite the introduction of nitrate in the anaerobic reactor provided that the presence of VFA is guaranteed. These results also allow rejecting the hypothesis of a possible inhibitory effect of nitrate or denitrification intermediates as suggested in the literature, since the pilot plant was able to maintain EBPR activity despite the high amount of recycled nitrate to the anaerobic reactor. The results demonstrate that the presence of VFA ensures EBPR operation process despite the presence of nitrate in the anaerobic reactor. Thus, VFA addition as external carbon source would also minimize the competition between PAO and denitrifiers in the scenario of low organic load wastewaters. However, the high cost associated with this addition makes it a difficult alternative to apply. One possible solution is the use of anaerobic fermentation of primary sludge (Moser-Engeler et al, 1998, Chanona et al, 2006) to generate a VFA-rich effluent. Another alternative is the addition of other low-cost external carbon sources to improve EBPR for COD-deficient wastewaters. We obtained promising results using the byproduct generated in biodiesel production (i.e. crude glycerol). The addition of this byproduct provides a carbon source for the denitrification of nitrate recycled and allows the in-situ generation of VFA in the anaerobic reactor. The utilization of this carbon source requires the development of a proper microbial community able to degrade/ferment complex substrates as glycerol to produce VFA. A direct replacement strategy of the carbon source was successfully applied for glycerol, starting from the original microbial community developed in the pilot WWTP. EBPR was maintained using glycerol as sole carbon source, with a proper selection of the fraction of anaerobic, anoxic, and aerobic phases. The anaerobic phase has to be long enough to facilitate fermentation of complex substrate to VFA and consumption of VFA by PAO. In addition, the aerobic phase should allow net P uptake. Regarding the initial distribution of the biomass, the initial microbial consortium requires the presence of a fraction of organisms capable of fermenting the complex substrate to VFA, but these microorganisms are usually present in activated sludge of any WWTP. Another important operational condition that needs to be considered is avoiding the excessive dosage of the external substrate, ensuring that it is consumed during the anaerobic phase to maximize its effect minimizing the overall costs. 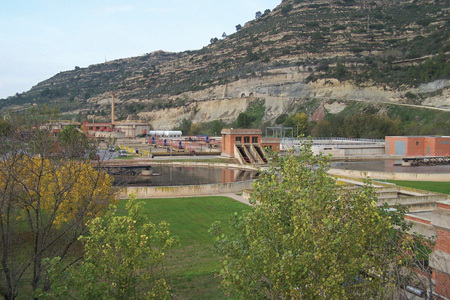 The controlled addition of glycerol for achieving a stable effluent concentration has been tested recently in our A2/O pilot plant, obtaining very good results for keeping a proper controlled P concentration in the effluent despite several disturbances applied to increase anaerobic nitrate inlet (Guerrero, 2014). The experimental results demonstrate that glycerol could be used as external carbon source for the biological removal of P in wastewater with low organic content. This process can be performed whenever the duration of the anaerobic phase, or anaerobic residence time in a continuous reactor, is sufficiently high to allow glycerol fermentation and VFA uptake. Additionally, the added organic material can also be used by denitrifying microorganisms to remove nitrate recycled to the anaerobic reactor. This dual effect provides improved stability of the EBPR process. Chanona J., Ribes J., Seco A., Ferrer J., 2006. Optimum design and operation of primary sludge fermentation schemes for volatile fatty acids production, Water Res. 40(1), 53-60. Cho E., Molof A.H., 2004. Effect of sequentially combining methanol and acetic acid on the performance of biological nitrogen and phosphorus removal. J. Environ. Manage. 73, 183-187. Flowers, J.J., He, S., Yilmaz, S., Noguera, D.R., McMahon, K.D., 2009. Denitrification capabilities of two biological phosphorus removal sludges dominated by different “Candidatus Accumulibacter” clades. Environ. Microbiol. Rep. 1(6), 583–588. Guerrero J., Guisasola A., Baeza J.A., 2011. The nature of the carbon source rules the competition between PAO and denitrifiers in systems for simultaneous biological nitrogen and phosphorus removal. Water Res. 45(16), 4793-4802. Guerrero J., Tayà C., Guisasola A., Baeza J.A., 2012. Glycerol as a sole carbon source for enhanced biological phosphorus removal. Water Res. 46, 2983-2991. Guerrero J., 2014. Understanding the underlying mechanisms of EBPR deterioration due to nitrate presence in the anaerobic zone of WWTP with simultaneous C/N/P removal. PhD Thesis. Henze M., van Loosdrecht M., Ekama G., Brjanovic D., 2008. Biological Wastewater Treatment. IWA Publishing, London, ISM 1843391880. Moser-Engeler R., Udert K.M., Siegrist H., 1998. Products from primary sludge fermentation and their suitability for nutrient removal. Water Sci. Technol. 38(1), 265-273. Saito, T., Brdjanovic, D., van Loosdrecht, M.C.M., 2004. Effect of nitrite on phosphate uptake by phosphate accumulating organisms. Water Res. 38, 3760-3768. Van Niel, E.W.J., Appeldoorn, K.J., Zehnder, A.J.B., Kortstee, G.J.J., 1998. Inhibition of anaerobic phosphate release by nitric oxide in activated sludge. Appl. Environ. Microbiol. 64, 2925-2930. Dr. Juan A. Baeza is Associate Professor in the Department of Chemical Engineering at Universitat Autònoma de Barcelona since December 2004. He leads the research line on biological phosphorus removal from wastewaters in the GENOCOV research group. Dr. Albert Guisasola is a chemical engineer and Ph.D. in Environmental Engineering. His main research interest is not only to optimize wastewater treatment processes, but to convert wastewater into a resource of energy, nutrients, and bioplastics. He is nowadays studying advanced biological and bioelectrochemical systems for wastewater treatment. Dr. Javier Guerrero is a postdoc Researcher in the Department of Chemical Engineering at Universitat Autònoma de Barcelona. He is also a member of the GENOCOV research group and his main research topics are addressed to improve biological nutrient removal in WWTPs by the implementation of novel and optimized control strategies.